The last time we saw valuation metrics like this, it was a buying opportunity in disguise. There's a good chance that we're looking at a buying opportunity right now with Apple (NASDAQ:AAPL) and don't realize it. Coming off the Mac maker's relatively disappointing earnings release, shares are now trading near 52-week lows. Despite some softness in the last report, analysts are still mostly bullish even as broader investor sentiment around Apple remains in the dumps. Surely you've heard that Warren Buffett quote about when to be greedy. With the rest of the market fearing peak iPhone sales and a China slowdown, now is probably that time. In recent years, following the implementation of its aggressive share repurchase program, Apple's capital structure has shifted significantly toward debt (the company now has nearly $72 billion total in long-term debt). This is actually a good thing, since Apple can easily afford the interest (which is completely paid for by its other investments) and the net effect is a meaningful reduction in Apple's weighted average cost of capital. But this also means that valuation metrics such as enterprise value become more useful, since enterprise value factors in cash and debt. Enterprise value is a company's market cap plus the market value of its debt less cash. Despite plunging copious amounts of debt-funded cash flow into share repurchases, Apple's net cash position continues to rise ($161 billion as of last quarter). If you look at each component of enterprise value, Apple continues to push its market cap down through repurchases, debt increases as it issues more bonds, but the company still generates so much operating cash flow that net cash continues to rise. Each of these directional factors mean that Apple has a remarkably low enterprise value relative to its earnings power. 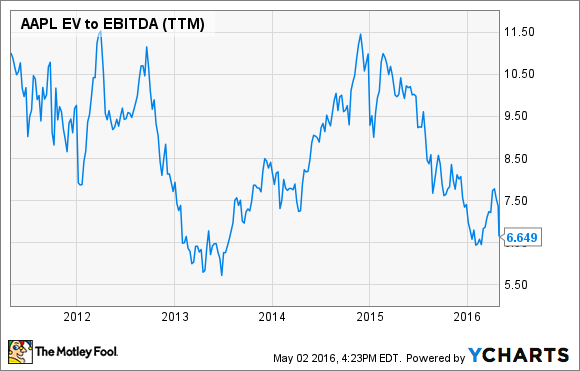 EV/EBITDA is now at a bargain 6.65. AAPL EV to EBITDA (TTM) data by YCharts. The last time that Apple was this cheap was at the depth of its 2012-2013 pullback, which proved to be one of the most compelling investing opportunities that Apple shares have presented in years. Now, like then, it seems as if Apple can do no right. iPhone unit sales seem to be peaking as the smartphone market has plateaued; China is facing some tough comparisons after soaring last year; this whole Apple Car idea seems kind of silly when you think about it; no one knows how Apple Watch is really doing. But we're talking about a company that has generated over $55 billion in free cash flow in the past year alone. Despite its best efforts to return capital to shareholders, Apple's net cash continues marching higher. On a per-share basis, Apple now has over $29 per share in net cash (even after factoring in the aforementioned $72 billion in long-term debt). Right now, Apple is trading at about 10 times trailing earnings, but if you back out that massive cash position, then its P/E ex-cash is really closer to about 6.9. Really makes you wonder why Apple is cooling off a little with its share repurchase program.